Hiya how are you all? 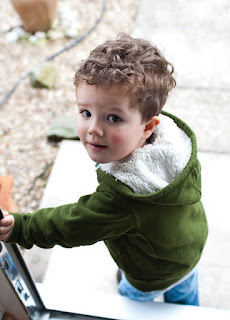 I am missing little Luca still, it was wonderful to have them both here he's grown so much he looks like a proper boy now, with plenty of attitude and extremely independent. Geez I don't envy my sister and Bil for the task they have with him. He is still as cute as it can be and I love him even more than before, he melts my heart every time he looks at me. I did get into trouble with mum more than a few times as she is very careful with salt and sugar in his diet so he tends to have healthy snacks all the time, but all that stopped as soon as he entered Mimi's house we had plenty of junk and jolly good it was to, he loved it.
. 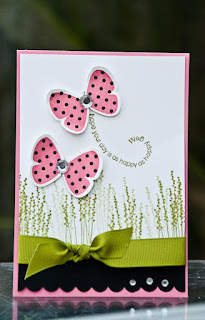 I did make a card last night with the Flight of The Butterfly and the matching punch again. They are so sweet and so easy to just stamp and punch them out. I have used Regal Rose, Old Olive and Basic Black. I have also stamped a few reeds with one of the Pocket Silhouettes set to look like long tall grass. The gems are from crystal brads that I have unpicked, perfect and you can get them in different sizes. My target was 20 and I ended up selling 19. Not quite there but not far either. I want to thank you so much for your support, I know you will LOVE this set for years to come and you should do this safe in the knowledge that you helped someone who so desperately needed it. Well Done!! Awww how Cute Luca is!!! 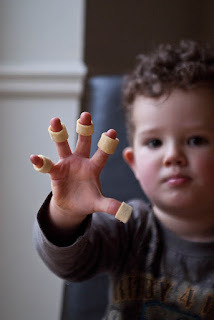 The art of hula hoops, yum!! A fab card too Monica, you never disappoint!! Luca is simply gorgeous! Lovely card too! !